Have you ever bought your cat a toy and they were more interested in the box than the actual toy? C’mon, we’ve all been there. It’s one of the biggest clichés of the cat world. So? Are cats interested in any old cardboard box or is it possible to design the most perfect cat box in the universe! 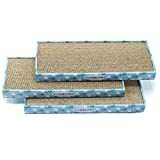 I mean, companies like GoPets have been able to create cardboard scratchpads that cats keep going back to. 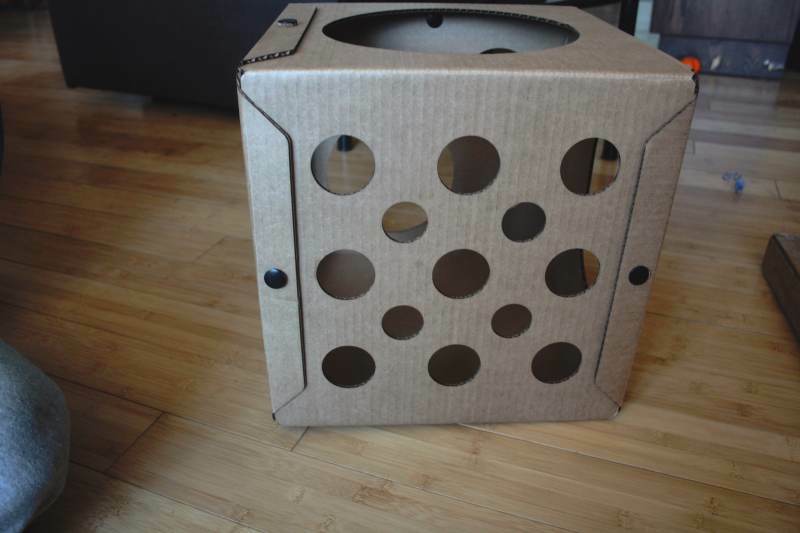 And I have to ask the question on everyone’s mind… If you were to design your own cardboard box for cats… would your cat be more interested in the box that it came in? Well, that’s what I hope to help solve today! I was recently approached by a fellow named Tom from Chicago. 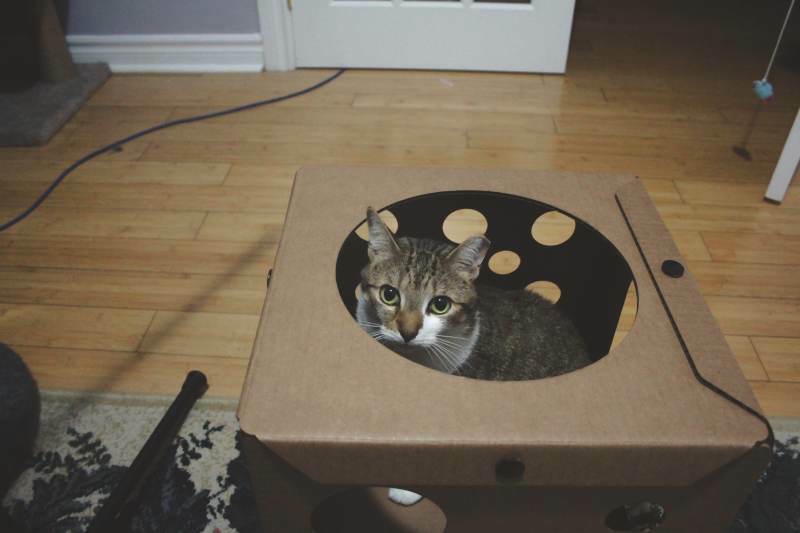 Tom launched a Kickstarter in November 2018 called Quickstarter: Cat Boxes for Happiness – Phase 1 in which he asked for folks to back up his goal in creating cardboard boxes for cats. The idea behind the boxes is to raise some extra funds for shelters in Chicago. Currently, Boxes for Happiness is getting ready for phase 2, which launches February 14th, and backers will receive a brand new more eco-friendly version of phase one. While phase 1 had plastic parts, phase 2 will be fully recyclable and Tom is hoping to have the cardboard all 100% recycled cardboard. *Note: The product that I’m currently writing about is not the product that will be given to those who help fund “phase 2”. The purpose of this “review” is mostly to document what the product in phase 1 was like and what the goal of phase 2 hopes to change about these boxes. Tom sent me a sample of the phase 1 box of happiness, which arrived fairly quickly with no trouble at all. We were very excited to have it arrive, especially because Kalista loves cardboard boxes! Upon opening the package, a huge smell of char came out of the package. Tom had warned me about this in advance. Since he was cutting all of the boxes with a laser cutter at his university, there wasn’t enough time to let the boxes air before packing them and sending them off. The smell lasted for a few hours after the box was built, and Tom assured me that the phase 2 boxes wouldn’t have this issue as he is teaming up with a manufacturer. There’s nothing worse than being given a product with confusing instructions. There’s absolutely nothing worse than what seems to be hours deciphering instructions only to have a half-built, half completely obliterated… whatever it was you were building in the first place! Well, there was none of that here! The instructions were very easy to understand. 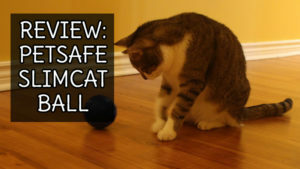 All cat owners can sigh in relief. 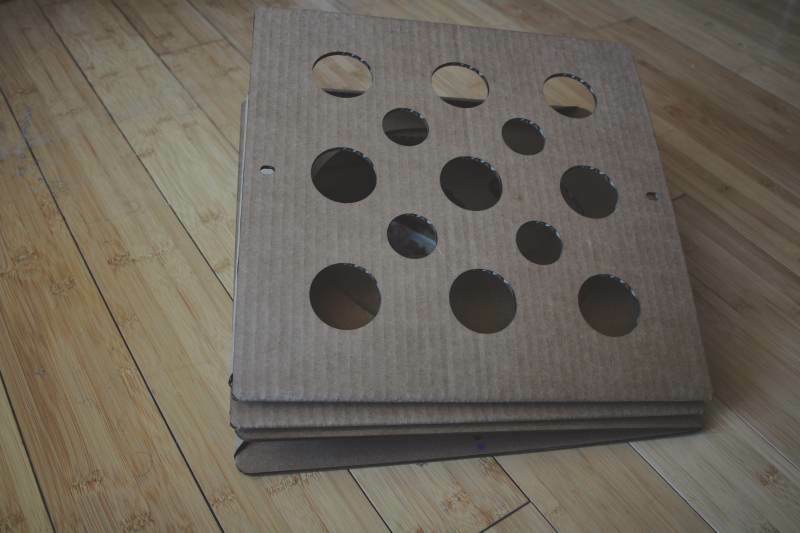 The box was split up into two pieces, each one with a number of holes in them as well as perforations for the clips to attach the pieces of cardboard. Each of the perforations was labelled with a colour, which coincides with the instructions given to us in rainbow order. Red, orange, yellow, green, blue, so on and so forth. 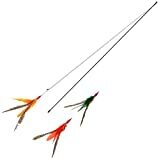 All you had to do was match the colours, slip in a clip on each end with cardboard washers and you were done! The instructions didn’t say whether you were only to use one or two cardboard washers while putting the pieces together, so we just put in 2 because there seemed to be enough for that. I did, however, reach out to Tom who said that these clips are no longer going to be used in phase 2, which is awesome to hear! This helps make the boxes more natural and easier to break down if they are damaged or no longer wanted/needed. I’d say all-in-all, the box took about 15-minutes to build with us taking our time. I truly thought that these boxes were adorable. In the past, we’ve made Beau cardboard toys as feeders and our cat Walker loved sleeping in boxes, so I thought this box would be a smash. I love the options and variants of holes. 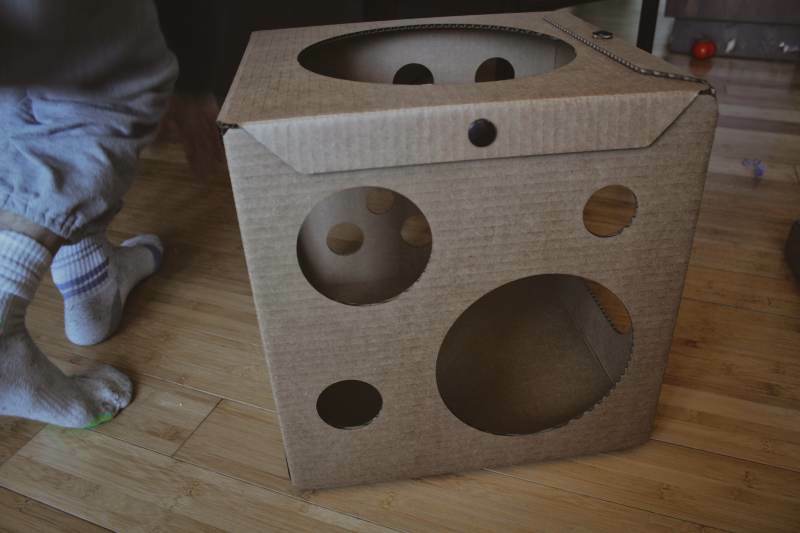 Our box has a huge hole at the top; a completely covered bottom; one side with 4 holes of 3 sizes; one side with a medium sized hole; one side with 13 small and small-medium holes; and the final side with one square entrance. A winner for every cat you would think… Think of all of the possibilities! Playing with the GoCat Da Bird! with the small to medium sized holes. 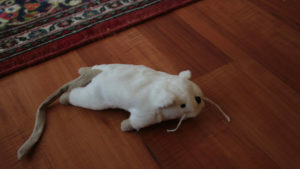 Making your cat grab plushies of catnip through the holes. 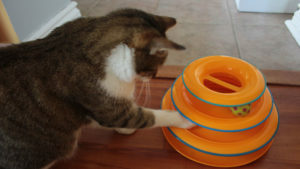 Hiding kibble inside so your kitty has to go in and out to get some extra exercise. Or even a comfy bed for your kitties to sleep in at night. Maybe even throw in a soft blanket to help encourage them. 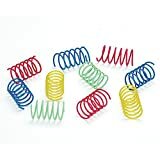 The only complaint I had was the clips, which caused the box to “wibble wobble” every so often and I could see them causing a cat to slide across a floor if they were running too fast. Tom has assured me that this is going to change in the newer models as he removes the clips. I’m shocked. At first, I thought it was the smell of the box that my cats didn’t like, but I’ve been trying to entice them to use the box for about 2-weeks now. Kalista will play with any of her toys, whether it be Da Bird!, her springs, or her catnip mouse right outside of the box, but as soon as you put any of them inside she looks at you then looks away. Biggest shocker. Beau sniffs the box every so often and will walk through it, but doesn’t really sit in it. I did catch him standing in it one night, which was adorable. Well, I’m actually pretty sad that my cats weren’t into these boxes. I think that Tom has a cool idea on his hands, especially while trying to create a fully recyclable product. He’s also been working on trying to create more complicated boxes, which he’s called “condos” so folks can build designs to their heart’s content. The main selling point to this piece is the fact that Tom is trying to source less expensive materials to keep the purchase cost low. Cardboard is cardboard at the end of the day and as long as my cat has a safe, sturdy box to sleep in or on, I’m happy. Not only that, because Tom is trying to keep the cost of manufacturing low, he is also donating 25% of the proceeds of Phase 2 to Chicago shelters and rescues. 25% is a pretty good chunk and who of us doesn’t have a soft spot for rescues and shelters? So, would this be a product I would try after launch? Yeah, I think I would give it a try. Why not? Dependant on what the final product cost ends up being, it may be worth giving it a try, and if my cats end up not liking it I know there will be other cats who will! So, what do you think about this project? Do you think it’s a cool idea because of what Tom is trying to do? Do you think you’re going to stick to regular old cardboard boxes? Let me know in the comments below! That sure looks like a fun box. Think you may try your hand at one? I think the problem is there are are too many holes My cats prefer boxes with only one opening in them. They want privacy and a place to hide undisturbed. A closed box with only one or two peep holes might work better. I was thinking the same thing, but I didn’t know if that was actually a thing. Thanks for sharing your review. We have the smaller box that’s low to the ground, but we are going to get this to see if our kitties will sit inside of it. Thanks for sharing your post. Have a wonderful rest of your weekend. In my experience it’s really more about the packing paper . Chewy boxes are the best. People swear they must put cat nip in on it. Once I built them a huge maze of cats boxes . They could go move through the boxes and I made all different cut outs on each one. I could not believe the lack of interest. I would be so pissed if I created a maze and my cats never used it! I made one for our hamster a while back, and she didn’t really get into it and that made me sad.